It seems the subject of space travel is everywhere at the moment. Here are just a few topics that have cropped up in my time line in the last few weeks. Firstly there was the timely and obliging space probe that landed on a comet right in the middle of our national Science Week, but for a while it looked like an inappropriate fashion choice would overshadow the momentous occasion. 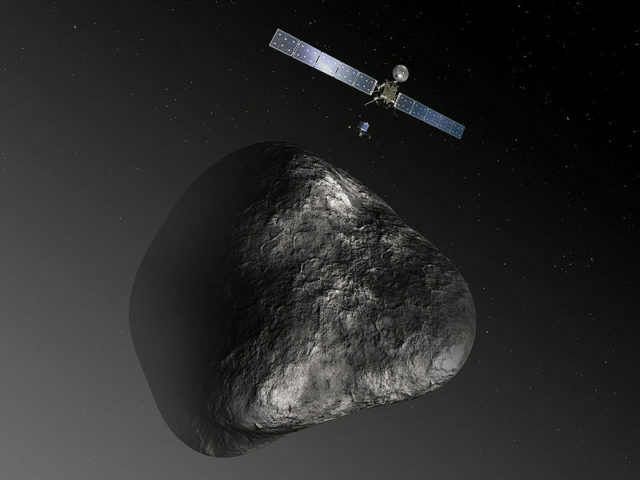 It was always an ambitious project of the European Space Agency (ESA), to get the rosetta spacecraft to rendez vous with Comet 67P/Churyumov-Gerasimenko, but, after ten years in space it arrived at its destination on 4th August 2014. Even more spectacularly, Rosetta sent out her Philae Comet lander which successfully landed on the comet on 12th November. The initial joy turned to fear as the science team involved, watched by the rest of the world, realised that Philea did not stay in the initial landing point but “bounced” along the surface on the comet, coming to rest, finally, in the shadow of a cliff. There was much worry as to whether the probe would receive enough sunlight in that location to power all its scientific equipment expected to perform a series of investigative experiments on the surface of the comet. In the end all fears were allayed and all data was collected and transmitted back to earth. The team were able to heave a collective sigh of relief, marking a new line in the history of space exploration. Hopefully the event will be remembered for its scientific breakthrough rather than the #shirtgate hash tag it spawned. I really enjoyed a conversation last night with my nine year old and his friend as we discussed what our favourite planets were and could we really live on Mars. When I spotted this video I had to share it with him and it certainly made him giggle. Speaking of space travel, it would seem that the moon is now back on the map for space exploration, this time spearheaded by the UK and funded by the general public. The very ambitious Lunar Mission One project plans to use crowd funding to finance a trip to the moon. The original mission will be a robotic exploratory project with plans to drill deep into the moon’s surface (possibly as deep as 100 Metres). The lunar rock that will be mined from these depths is expected to be about 4.6 billion years old and it is hoped that it will shed new light on the original formation of the moon and indeed the earth and the entire solar system. The incentive for potential funders is obviously to be part of such exploration, but, as an added bonus, each person who pledges money will be able to include something into a public archive, a type of time capsule that will be buried on the moon during the mission. This archive will include information on must of our planet’s historical events, as well as DNA from people who have funded the project. Of course NASA take credit for the original moon landing and a lot more besides, but did you know that a lot of items of everyday use stem from technology originally created for space exploration? This infographic lays it out really well and I was certainly surprised at a lot of the items listed. It would seem that space exploration is a hot topic in Hollywood too with the recent release of Interstellar. In the movie the mission is to travel farther than ever before to find a new home for humanity as earth will cease to support life within one generation. To travel these distances the team must use wormholes, a theory that some hope will one day become a reality. The expert advice on this one however is that wormholes, as we know them would never be able to support human travel. They would require more negative energy than space can provide, in order to stay open long enough to allow such travel.